The Youth of Today – Are You Laughing At Me? As I am no longer a youth, I can now speak on this subject with some authority, having experienced it from both below and above the youthfulness timeline. I am currently holidaying in Crete. A German supporting the Greek economy. Shocking. Angela would not be impressed. Or perhaps she would be as it might increase the chances of getting her Euros back. I wonder if I could be awarded the freedom of a city for my efforts. Best buy some more olive wood salad servers. I am tipping well, Angela. I quite like München, or Berlin. Last night we went to dinner in the local fishing village. Driving half on, half off the hard shoulder like a true Greek whilst trying to smother the inner cries of protest from my German driving genes that could not deal with this flagrant disregard of the road traffic rules, we arrived and found a parking space right in front of some sort of memorial. A group of four youfs were doing something to it. We all tensed. Vandals!!! Outrageous!! Walking past I saw the dates on it, 1897, then the all too familiar 1913, 1948. A war memorial. I also saw that the youfs were using black paint. 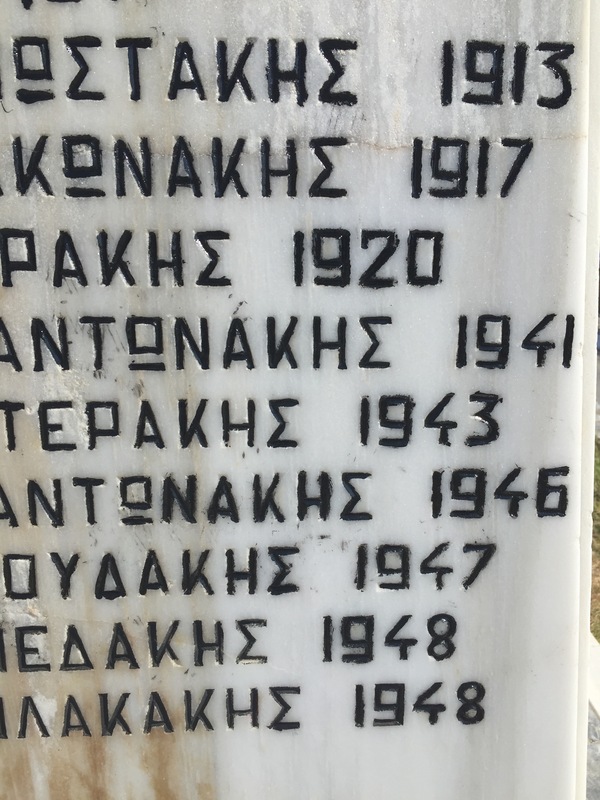 Black paint, to restore the names of the fallen, chiselled into the white marble back to their original condition as the previous application had faded in the sun and weather. We went to dinner, had a teenager/grownup strop, investigated what looked like the underside of a ray in the harbour (it was a rock, I said all along it was a rock) and walked back to the car. “It is our history. We might not have money, but we have history”.